Apogeum PA Majors is a fully automated Expert Advisor that features a custom algorithm for recognizing the Price Action, based on deviation of the standard price volatility and origination of a trend. This allows the system to trade exclusively during high-volatility periods of the market, as trend movements have a high probability to continue in such periods. 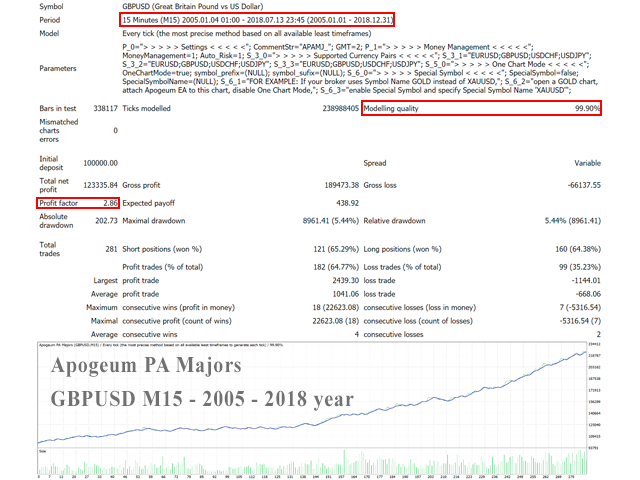 Unlike Apogeum Price Action, Apogeum PA Majors is designed for trading the major pairs, which have the greatest liquidity: EURUSD, GBPUSD, USDCHF and USDJPY. Due to this, the system produces more stable results, is less sensitive to market noise, and its use is safer and more conservative. Apogeum PA Majors is an investment strategy, designed for long-term use with medium-term trading style. Due to this, the system operation results are less dependent on the type of client account (ECN, STP or other), level of spread, commission and slippage, which provides a greater stability in operation. M15 - currency pairs supported on М15 (EURUSD;GBPUSD;USDCHF;USDJPY). М30 - currency pairs supported on М30 (EURUSD;GBPUSD;USDCHF;USDJPY). Н1 - currency pairs supported on Н1 (EURUSD;GBPUSD;USDCHF;USDJPY). Special Symbol - activate the Special symbol mode (for example: if your broker uses USDEUR instead of EURUSD, attach the EA (with the One Chart Mode disabled) to the chart and enter "EURUSD" in the Special Symbol Name field). 3. This is a system not for users, which want to get a crazy profit - it's a for pro-investors, which are understand all benefits of Price Action strategies. 5 stars for Apogeum PA Majors! And 10 stars for Ivan's support - he is a one of the most professional developers here! Great backtests on realistic conditions, proven track record on real with hard earned experience from other iterations. Poised to keep bringing profits. 2018-09-13 Update: Profits on forward testing as expected (no surprise). 2018-11-12 Update: EA handled greatly the US elections. 5. Good Live results since January 2018, when another Price Action system had a losses. So for now – 5 stars. Good Luck, Ivan!